Expand the Part Configuration, Right click the Undefined Bounding Shape at the bottom of the collection, and change it to Box. Now pick the Validate button from the toolbar (the stoplight). Once completed, the application will add 3 other parameters, to control the ‘Box’ that is displayed in the 2D view styles. These are SBSH, SBSL, and SBSW, which are Structure Box Shape Height, Length, and Width respectively. Let’s edit these in the Model Parameters, so that they are useful, and tied into our system. Your parameters should look something like this. This is where it really begins to become painful. Sometimes the application will not allow you to change things the way you want. Be patient. 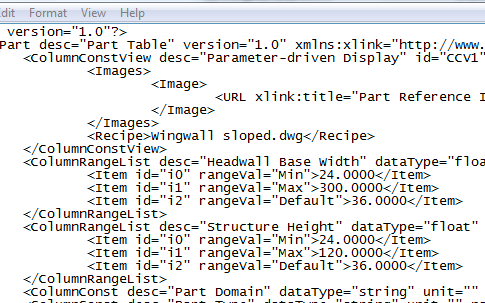 This area is what gets published to the XML file, that ultimately is the catalog. Ranges and lists get created here. I’ll skip through the hooplah, and get you right to it. The following Dialog shows up, representing all the Model Parameter settings we have made so far. I have already made some further changes, so I will walk you through these. Data Storage is how you will access the information. Range is a range of options, List is a list of options, Calculation is something resulting from another variable, and Constant is a static value. The visible items appear in the Part Properties. Now select the Parameter Configuration pull down button at the top, and select Value. The dialog will arrange itself with he value of each field. IF IT DOES NOT DISPLAY THE VALUES, GO BACK AND CHECK YOUR MODEL PARAMETERS, something got screwed up. The odds are that something in the recent Program Parameters has been cross linked. Sometimes you can save the part, leave and reenter part builder, and go back into Size Parameters->Values, and they will be there. Another good solution is to disconnect the ‘bUser’ variables, and give them static numbers, as well as the Program Parameters. Then go back to the Size Parameters and check the values again. Eventually it will let you in. Then you simply troubleshoot one variable at a time. If you do get locked out of the values, revert all configured Ranges and Lists back to Constant. Validate the part, and save out of the part builder. Get back to where you can start THIS session over, and go a bit more slowly. Another option is, after resetting the User parameters, is to delete the Program parameters, and re-validate them in. Don’t worry, if you save the backup when I mentioned it, you have not lost anything. Double click on the SHBW value, and the dialog will appear allowing the MIN, MAX, and Default values to be input for the range. Notice the small green and yellow button that has activated next to the values pull down button. Select this to send the changes we made back to the Model Parameters (because we changed the default values from 24 to 36). The model will update. 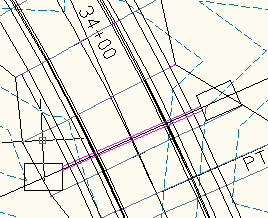 The catalog will display a preview image for your use in the Civil 3D application. We generate this by selecting the Generate Bitmap button from the toolbar. A selection of views is available to choose from, (I like isometrics). When satisfied, pick OK. The Bitmap will appear when choosing the structure. NOTE: The bitmap may appear accurate, but this only means that the modeling was completed correctly. This is absolutely no guarantee that the model will be successfully implemented by the application. This is very obvious when modeling in non-orthogonal planes. Hit the validate button again and save the part, and close it out. This is where things get weird. Even though you have selected the range values and program parameter values, the application rarely saves the values to the XML file accurately. We need to go do some surgery. Navigate to the Program Data (VISTA) location where your catalogs are stored, and open the respective XML for the structure you just saved. I use Textpad, but notepad works fine. Once open, the first thing you may notice is the Ranges you created. Very often the ranges are still default values. If so, change these values to what they should be. 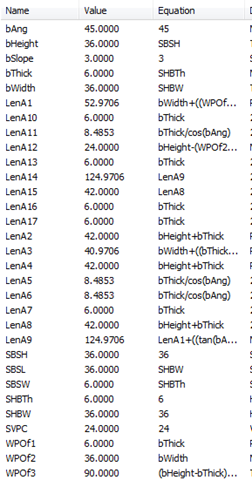 Next scroll to the bottom of the file, and review the Program Parameter values recently added (You really have to read it well to find them in the last 5 or so lines). These are often 0.0. If so, change them to the correct values. Remember to use the ‘$’ with any variables, i.e. $SBSH. Go back to the Part Builder, and select the catalog. Select the Catalog Regen button and watch for any errors. There shouldn’t be any. Edit the Part List and add the new structure. Select the parts list you are using, perhaps standard, I use ENG. Right click and select edit. Select the Structure Tab. 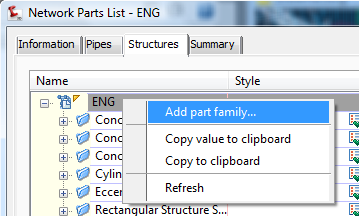 Once the parts list is opened, right click on the header and select ‘Add Part Family’. The option brings a dialog box with the unselected families available. Select the “Wingwall Sloped” structure, and the preview image should appear to the right. The family will appear in the list. 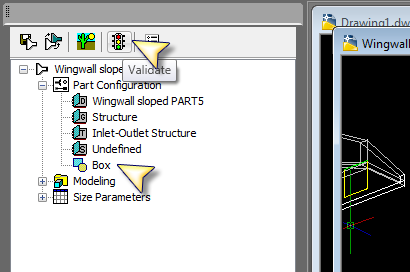 Right click the ‘”Wingwall Sloped” family, and select ‘Add Part Size’. 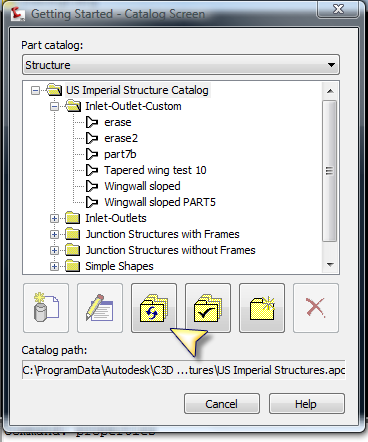 The Part dialog appears to change the part size and to name the part. Simply hit OK. We can adjust the Height and Width in the Structure properties as we see fit. We cannot however adjust them here. At this point the Structure is available for use. 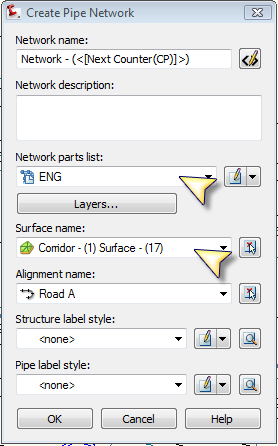 The Create Network dialog appears, prompting you for the Parts List, Surface Name, Alignment Name, etc. Enter the Parts List you recently modified, and the surface of choice. Hit OK. The Network Layout toolbar appears, allowing you to prepare the network parts to be used. 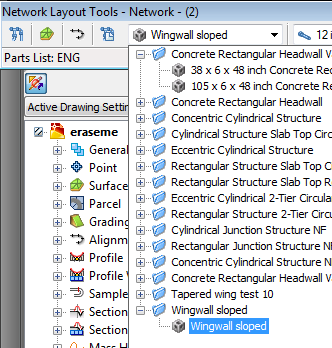 Select the ‘Wingwall Sloped’ from the Structure list. 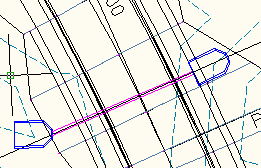 Hit the ‘Draw Pipes and Structures’ button, and pick 2 points across your corridor surface (or whatever you selected). Notice the ‘Box’ display. This is due to the style selected when we added the part family to the network list. Right Click on the structure, and select Structure Properties. Select the Information Tab. 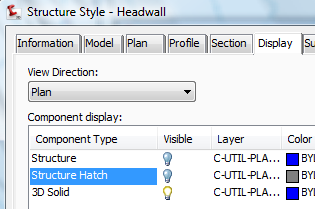 Create or edit the Structure Style (I used one called Headwall). 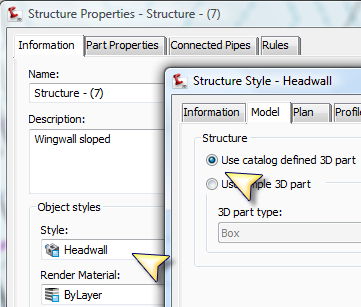 In the Information Tab, change the Structure display type to be ‘Use Catalog defined 3D part’. Then in the Display Tab, ensure the 3D solid is turned on. Hit OK, and OK again in the structure properties. The display should update to something like this. At this point SAVEAS the drawing to something else. The reason is if anything goes wrong and you need to fix the structure in part builder and add another part family, you want to know that the drawing you will insert it into is clean, and not bugged by a previously flawed structure. Grip edit the structures in the correct direction. 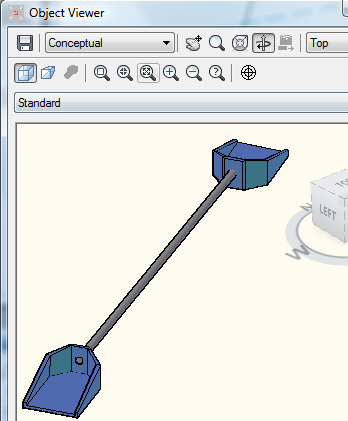 Then select a structure, and the pipe, Right click the display, and select Object Viewer. At this point the structures com in properly. Because we have the flexibility to change the Height and Width at will, the application cannot keep up, and sometimes the structures get misaligned with the pipe. These structures are Invert driven. So edit the pipe inverts to elevate the structures appropriately. There is a lot you can do with this structure, both good and problematic. A good measure of bounds checking and structure limitations can be added to help this adapt more fluidly. If anything goes wrong for you, please let me know. Sometimes I get a bit ahead of the instruction and don’t realize it, and sometimes let a bug get in (I debug while I write the article). In the next session I will show how to put the side slope in a list to select from, and hopefully some edits to help control a bit more. I will also list some more criteria, requirements, and limitations as I have collected info from tha application and all those going through this with me.